A 363 Sale refers to the sale of an organization’s assetsTangible AssetsTangible assets are assets with a physical form and that hold value. Examples include property, plant, and equipment. Tangible assets are seen or felt and can be destroyed by fire, natural disaster, or an accident. Intangible assets, on the other hand, lack a physical form and consist of things such as intellectual propertyr under Section 363 of the US Bankruptcy Code. The sale allows debtors to fulfill their obligations to creditorsTop Banks in the USAAccording to the US Federal Deposit Insurance Corporation, there were 6,799 FDIC-insured commercial banks in the USA as of February 2014. The country's central bank is the Federal Reserve Bank, which came into existence after the passage of the Federal Reserve Act in 1913 by selling their assets and using the funds collected to settle their debts. The purchasers of the assets also benefit from the opportunity to acquire valuable assets that are free of liens, claims, or other encumbrances – and often at discount prices. The bankruptcy court grants the debtor-in-possession or trustee the power to sell the organization’s assets even when there is an objection from junior creditorsJunior TrancheA junior tranche is an unsecured debt that ranks lower in repayment priority than other debts in the event of default. It is also referred to as subordinated debt. When a company goes into liquidation or bankruptcy, the creditors receive payments in order of priority, with senior debt receiving payments first., after a court hearing of their petition. 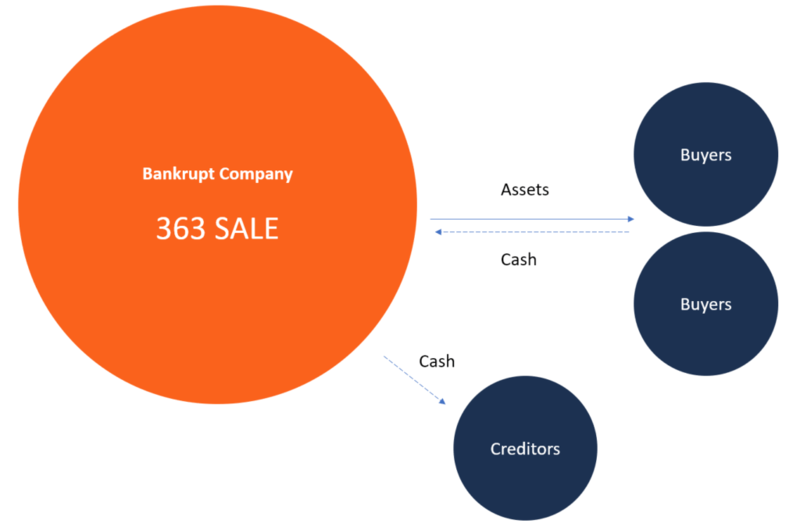 The 363 sale gives the debtor-in-possession more control in the disposition of assets than is the case when a trustee is allowed to sell assets under Chapter 7 liquidation bankruptcy. The debtor-in-possession controls the disposal of assets under the protection of the bankruptcy court, giving the debtor the opportunity to control the deal terms offered during a bidding auction. In a Chapter 7 liquidation bankruptcy, the court-appointed trustee disposes of the assets without the involvement of the debtor-in-possession. The 363 sale starts with the debtor marketing the organization’s assets to attract potential purchasers. If there are several interested purchasers, the debtor settles on the highest bidder to act as the stalking horse bidder. This bidder’s price works as the base price for the auction bids, and the other bidders will use this bid as a benchmark. A stalking horse bidder helps set a “floor” price for assets to be sold at auction, thereby protecting the debtor from a situation where they might only receive unreasonably low bids for their assets. In return for this, the debtor offers the stalking horse perks such as breakup feesBreakup FeeA Breakup Fee, also referred to as a termination fee, is a penalty that is paid in mergers and acquisitions transactions if the seller backs out of the deal. The fee is required to compensate the original purchaser for the time and resources spent in negotiating the deal., reimbursement of certain expenses, or bidding terms favorable to the stalking horse bidder. The debtor and the stalking horse bidder work together to draft an asset purchase agreement that outlines the terms of the auction sale. After the preparation of the asset purchase agreement, the debtor then seeks court approval for the sale of assets at an auction commissioned by the court. The debtor also seeks the court’s approval of the procedures and rules to be used during the auction, as well as its approval for any incentives offered to the stalking horse bidder. The bankruptcy auction’s competitive bidding format is designed to maximize the price the debtor receives for the assets on sale. The auction procedures may require things such as minimum bid increments and offer bidders enticements such as exclusive rights – for a stated period of time – to bid on certain assets. The motion for approval may request the court to expedite the bidding process. The approval of procedures may take up to seven days, after which the debtor informs interested buyers of the auction. The court may allow up to 30 days for the bidders to place bids. The duration of the bidding period typically varies in relation to the type of assets being auctioned. After the bidding period ends and the bidding closes, the auction is opened. The debtor makes public the bids from the interested purchasers and then chooses the winning bid in a transparent atmosphere. After the close of the bidding and announcement of the winning bidder, the court must approve the sale of the asset before it is transferred to the successful bidder. If there are parties that object to the sale, they must state the reasons for their objections and make their case to the bankruptcy court at this point. The debtor must also demonstrate to the court that there is a sound business purpose for selling the asset(s), and indicate whether the fair market value of the asset is increasing or decreasing. The bankruptcy court reserves the right to approve or reject the sale of assets, depending on the issues presented before it. One of the reasons for seeking court approval of the sale is for the court to rule that the sale of assets was for “fair consideration”, and thus reduce the risk of a fraudulent conveyance challenge. If the court rules that the asset sale was made in “good faith”, that ruling offers the asset sale protection from a possible reversal on appeal. A 363 sale commissioned by the bankruptcy court benefits all the parties involved. Debtors who do not want to go through a reorganization benefit from the opportunity to maximize the returns from selling their assets through a competitive bidding process. Purchasers get an opportunity to buy assets at a bargain price with the approval of the court and without worrying about a reversal of the sale, as long as the auction is conducted correctly and the court rules that the sale was done in good faith. Purchasers also benefit by obtaining ownership of assets that are free and clear of lien or claim. A 363 sale also benefits the creditors. As key stakeholders in the bankruptcy process, they may object to, or approve of, any motions presented by the debtor to the court. For example, if the debtor seeks approval for the sale of assets to a purchaser at a lower valuation than either the fair market value or the highest bid by another bidder, the court must listen to the creditor’s objections before granting approval or rejection. Also, a 363 sale enables secured creditors to place a “credit bid” which may cancel some or all of the debts owed by the debtor to the creditor. When collateral that served as security for a loan previously made to the debtor is put up for auction, then the secured creditor is not restricted to making only a cash bid for the collateral asset – they may instead opt to bid the amount of debt owed them by the debtor on the loan for which the asset served as collateral. Let’s look at an example of credit bidding: Assume that Creditor A had loaned $750,000 to a company that is now holding a 363 sale, with the loan fully collateralized by the company’s asset, a vintage 1960s jukebox signed by Elvis Presley. Without having to draw on its working capital or other cash or cash equivalent reserves – or take out a loan to fund the purchase – Creditor A may simply make a credit bid for the jukebox of $685,000, the principal amount still outstanding that the debtor owes on the loan. If that proves to be the winning bid, then Creditor A can take possession of the jukebox without having to pay cash for it, but instead merely by crediting the debtor as having paid off the loan (subject to the bankruptcy court’s approval). Some interested potential purchasers of assets at a 363 sale may be uncomfortable with the transparent nature of the bankruptcy proceedings that make their bids public. The high level of transparency subjects the purchasers to a greater risk of being outbid. Also, having several interested purchasers may complicate negotiations for the stalking horse bidder. Another limitation of a 363 sale is that, if the manner in which it is conducted does not conform to the requirements of the bankruptcy court, then the asset sales will not be approved by the court. If the court rules that a sale was not conducted in good faith, then the sale may be reversed on appeal and the debtor may have to go through the whole process all over again in order to successfully conclude the 363 sale.